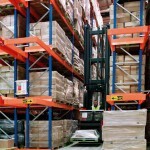 What are the weight limits for Pallet Racking? Regarding pallet racking weight limits, there are many and varied limits available. The maximum load allowed per pair of beams is normally 4 tonnes, but standard load is 2 tonnes where 2 No. 1 tonne pallets are sited next to each other. 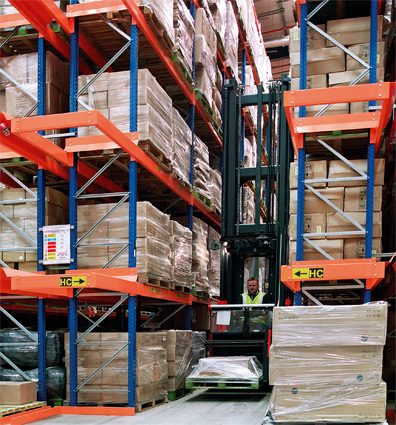 Most pallet racking systems have a standard duty frame, a medium duty frame and a heavy duty frame with standard duty frames normally carrying 9 tonnes, medium duty 15 tonnes and heavy duty 20 tonnes, dependent on the heights and depths of the frames. The general specification for pallet racking is the width of the bays, the standard bays being 2.7m wide, therefore 2 No. 1200mm pallets can sit on the beams giving a 100mm gap between each pallet and the end frames. Depths of frames can vary but the most standard is 900mm where a 1m deep pallet will sit on the beams leaving a 50mm overhang either side, which is the ideal safety standard. Normally 75mm is then left between the top of the pallet and the underside of the next beam level, which gives clearance for the pallets being lifted from the beams. The frames can be any height to suit the warehouse they are being installed in and the frame depths can vary from 900mm to a maximum of 1500mm deep. On systems where there are varied sizes of pallets, pallets support bars can be used across the beams, front and back, to store the pallet safely. This can also be achieved with shelf panels but these have to be checked from the point of loadings and that they do offer a load bearing capacity. Mesh shelf panels can also be fitted onto the beams and for stillage systems there are skid channels which are similar to pallet support bars but are a channel system so the stillages fit onto the skid channels safely. All pallet racking is bolted to the floor for extra safety and safety racking clips are fitted into the beams and the frames for extra safety when the pallet systems are being loaded/unloaded. Leg and corner guards can also be fitted for additional safety.